Many of the great, long-lived Stellenbosch Cabernet Sauvignons of the 1950s, 60s and 70s conspired over a secret ingredient. Cinsault was hidden within the wines without mention on the label, lending elegance and perfume to these Cape classics. Sadly, this fine and most regal of reds was later dethroned by more bombastic, yet unworthy usurpers – until now. The Revenant Red celebrates the glorious rebirth of a long-lost Western Cape classic. 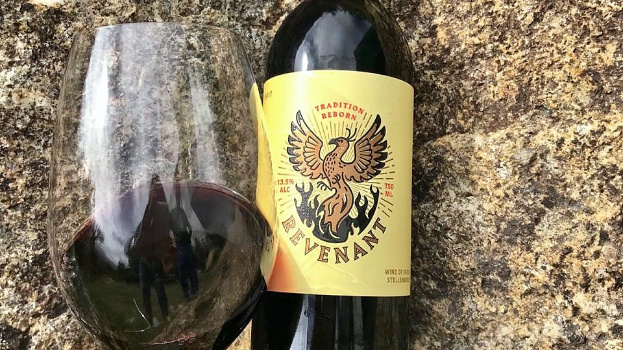 This inaugural vintage of Revenant Red was produced for False Bay Vineyards at Waterkloof. It is preceded by the Revenant White, a white blend of Sauvignon and Chenin Blanc – a wine with a special link to False Bay Vineyards, being the very same blend as the first white wine made by owner Paul Boutinot in France back in 1984. The Cinsault grapes originate from a bush vine block that is approximately 35 to 40 years old. It is situated about eight kilometres from the ocean and produces very low yields due to its age and because it is unirrigated. The Cabernet Sauvignon vineyards also overlook False Bay and are 10 to 15 years old. Various blocks were used – some approximately 250m above sea-level and some lower down.